Commonbank tri-series cricket final between Australia and India was nearing a nail-biting finish.Michael Clarke was bowled by PraveenKumar through the gates and as a result the mighty Symonds makes his way into the pitch. Before he could settle down, a streaker from the crowd tried to distract him by running into the pitch,haplessly followed by six cops.The mad streaker was just going around in circles and just when everyone thought that nothing could stop him,Symonds moved forward and whacked the puppy-shame-boy with one whacky hook that bonked his brains and the next moment;he was lying flat on the ground. I am still laughing thinking about the incident. Another Incident that crosses my mind was the brat-clash between javed mianded and Dennis Lillee. 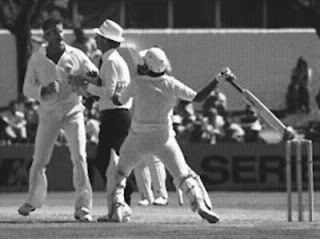 Mianded thought that Lillee tried to block him while he attempted a single and after the intial exchange of words, Lillee kicked Miandad on his pads and that was what Miandad was waiting for.Miandad, started charging towards Lillee with his bat lifted high above the head, as if to hit him. The umpire's intervention prevented what could have turned out to be a real assault had Miandad gone head with his plans. However, the picture of Miandad hurling his bat at Lillee made the whole incident look even worse, and was promptly declared as the most indignified incident in the history of Cricket. The third incident happened when the whacking was given to the ball.It was the 2003 worldcup match between India and England. 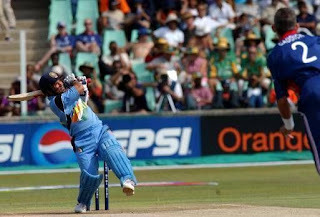 Caddick bowled a bouncer at Tendulkar that bounced above his head. Caddick's immedia te remark was," Grow up baby! You could kiss the ball". The silent Tendulkar was calm and composed as ever and the very next ball which also was aimed at his face got a different treatment; no words exchanged, but Caddick got his answer;pure Tendulkar Style. That six is stillrated as the best six ever hit in a worldcup match. At the end of the match, Caddick said," He is indeed the little master"
By the way, I am in the playing 13 for the inter-firm cricket match this weekend. I know that I wont make it to the team as I would be asked to do the commentators' job. But if I get an opportunity to bat for my side, there would definitely be some hard-core whacking. The bat is there to whack yes LOL! you forgot when sidhu running with a stump incident.